Adrian Jackson, front row right – next to Hunter Watson. Adrian Jackson was a very fine runner indeed and when I first came into the sport in 1957 he was one of the best in the country – bear in mind that the 1950’s was almost a ‘Golden Decade’ for Scottish distance running. Colin Youngson wrote this profile and as you read it, note the names that he crossed swords with and you will appreciate the quality of the athlete. Hunter Watson, who later became a long-serving Club Secretary for Aberdeen AAC, was studying at Edinburgh University when news came in Autumn 1953 that an outstanding young runner from Yorkshire was about join the Hare & Hounds. [Hunter was a talented athlete who went on to win the East District Youth CC in 1954 and to finish second in the Youth National CC. Later that year he became Scottish Junior Mile Champion. In 1955 Hunter was East District one mile champion and in 1956 secured Scottish Universities titles at one mile and three miles. He enjoyed a long career, winning bronze and silver medals in the Scottish Senior 880 and Mile; and eventually retired to concentrate on coaching after victories in: the 1976 British Veterans 800m; 1976 Scottish Veterans 800m (in record time); and 1977 Scottish Veterans 1500m (also a new record).] He remembers sitting in a train compartment, travelling from Edinburgh to Kirkcaldy before the first East District League race of the Winter season, and trying to guess which of his team-mates was this new star from the North of England. He did not realise that the short fellow opposite was that very man, Adrian Jackson, who was to be the Best Man at Hunter’s wedding and a lifelong friend. Hunter sums Adrian up as “a very pleasant, unassuming wee chap”. Hunter featured along with Adrian in many winning EU teams, including the 1955 Scottish Junior CC. In early 1954, after a thrilling race for the East District CC title, Adrian finished only three seconds behind the winner, Sandy Robertson (ESH), but led Edinburgh University Hare & Hounds to the first of three consecutive team victories, when they lifted the Fraser Trophy. Adrian, that year’s Scottish Universities CC Champion, was favourite in the 1954 Scottish Junior National but, as Colin Shields noted in his centenary history of the SCCU “Young John MacLaren of Shotts Miners Welfare Club, who had the handicap (due to a childhood attack of polio) of a withered left arm tied to his chest, ran a sensational race …. showing grit and courage to defeat Jackson by four seconds.” Nevertheless, Edinburgh University won the award for first team. 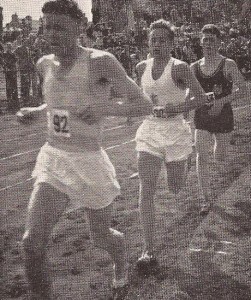 In early summer, Adrian won the Scottish Universities track events over one mile (in front of Hunter Watson and Alastair Wood) and three miles, a feat he repeated in 1955, 1958 and 1959. He also broke SU records at these distances. In the East Districts, he was first in both one mile and three miles. His time in the latter (14.27.1) was a new record. Then on the track at New Meadowbank, Edinburgh, Adrian Jackson became SAAA Champion at one mile. After a tactical race against J.L Hendry of Walton AC, Jackson won in 4 minutes 19.5 seconds. Emmet Farrell commented in The Scots Athlete “The time might be considered workmanlike, but for a man regarded primarily as a two or three-miler, it was a grand effort”. Apart from the mile, Adrian’s best times that season were: 2 miles 9.14.8; 3 miles 14.22.1. 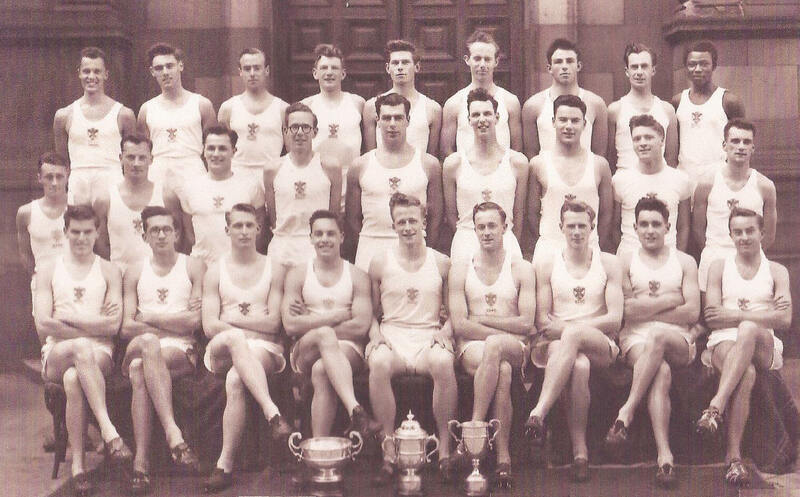 In November 1954 at Galashiels, Edinburgh University won the Mackenzie Cup after winning the Eastern District Ten Miles CC Relay. A few days later Adrian ran on the prestigious Stage Six in the Edinburgh to Glasgow Road Relay, when the Edinburgh students did very well to finish fourth. Adrian won the 1955 British Universities CC title, by 150 yards on Wimbledon Common. That season’s Scottish National Junior Cross-Country Championships produced a similar result to the previous year: A.S. Jackson second to John McLaren (who later had a tremendous run to win the English Junior CC as well), with EUH&H retaining their team title. Scorers were ‘The Famous Four’ – Adrian Jackson, Adrian Horne (1956 East District CC winner), Hunter Watson and Jim Paterson (who won Scottish titles at 440, 880 and Two Miles Steeplechase and in 1957 became National Record holder over 800 metres with the outstanding time of 1.47.5). During the track season, Adrian won the Scottish Universities mile (once again, in front of Hunter Watson and Alastair Wood) and three miles. However in the East Districts mile, Hunter outsprinted Adrian to win in 4.18.1, which was a new record. Then AS Jackson defended his Scottish One Mile title, but finished second, well behind the new star Graham Everett. Undoubtedly, one of Adrian’s finest achievements was when he won the 1955 World Student Games 5000m in Spain. San Sebastian was the venue; the redoubtable General Franco presented the trophy; and shortly afterwards, Adrian lost it and never saw it again! He was third in the Scottish rankings for Three Miles (14.13.0). Later that year in the E to G, the Edinburgh Students were eighth, with Adrian again on the longest Stage Six, only 28 seconds slower than the fastest man, Eddie Bannon of Shettleston (who was National CC Champion four times). 1956 was a very successful year for Adrian Jackson. In the summer he won the East Districts One Mile and then became Scottish Champion in the Three Miles track event – another tactical victory (14.33.6) at New Meadowbank. In The Scots Athlete, Jim Logan reported: “This race was another cat-and-mouse, with the issue clearly between Adrian Jackson and Andy Brown. Jackson began his effort at the second-last bend and almost met disaster when he collided with a lapped man who politely, but belatedly, moved out to let the leaders pass inside. Jackson was undisturbed by the incident and raced home seven seconds clear in a very fast finish.” The cover photo of The Scots Athlete magazine for August 1956 shows Adrian stalking the early leader Bobby Calderwood, with a very young-looking Andy Brown tucked in behind. Adrian’s fastest time for three miles that season was 13.55; and for two miles 9.00.7. He was first in the Scottish Rankings for both events. Bobby Calderwood, Adrian Jackson and Andy Brown in the Three Miles in 1956. He also won the British Universities 3 Miles Championship. After that, an invitation came to take part (one of two British athletes) in the Mannerheim Games in Helsinki, on the 1952 Olympic track. On 4th June he won the 5000m in 14.13.6, which was tenth on the British all-time list. That time would have been good enough for fourth in the Olympics (when Emil Zatopek had won in 14.06.6). In 1924 Paavo Nurmi’s world record had been 14.28.2. Adrian was first in the Scottish 5000m Rankings. In 1957, Adrian regained both the Scottish Universities CC (in Aberdeen) and the British Universities CC titles. He also won the East Districts CC (and repeated this feat in 1958, 1959 and 1961). In 1961, having graduated from EU at last, he represented Braidburn AC and narrowly defeated the rising star John Linaker from Pitreavie AC. In the summer of 1957, Adrian did not compete, probably because of injury or studying for important examinations. In 1958 he retained his SU CC crown in Edinburgh; and was second in the Scottish Three Miles (14.16.2). He also ran 14.05.6 that season and was third in the ranking list. George Brown (later on a stalwart for ESH, see The Fast Pack) studied at EU between 1956 and 1959 and ran well on track (4.12.7 mile), country (featuring in SU CC team victories) and road (sub 50 minutes for the Tom Scott 10 Miles.) George remembers Adrian as quiet, pleasant and extremely modest. They used to train by running five and a half miles from King’s Buildings, down to Liberton Dam, across some flat country, then farmland, followed by a tour of the tough Braid Hills. This demanding route was also used for EUH&H time-trials! Scottish International runner and Scottish Three Miles Champion Steve Taylor of Aberdeen AAC remembers Adrian Jackson as a polite, well-liked gentleman. However Steve recalls with chagrin one East District so-called Cross Country Championship at Newcraighall, during a foot-and-mouth crisis in 1961, which had to be run on the road. Taylor had a good lead but Jackson finished very strongly to push him into second place. Steve also remembers a dreadfully hot International CC Championships (1961 at Nantes) when Adrian and he both suffered, due to the temperature and the formidable concrete barriers which had to be cleared. Adrian Jackson’s best placings in Senior National CC (contested over nine gruelling miles at Hamilton Racecourse) were 7th in 1958 and 6th in both 1959 and 1961. Consequently he was chosen to run for Scotland in the International Cross Country Championships in: Cardiff 1958, (46th), Lisbon 1959 (30th) and Nantes 1961 (51st). He was a scoring member of the Scottish team in 1958 and 1959. In 1959, Adrian won the Scottish Universities CC title in Glasgow, with David Carter from St Andrews University in second place. That summer Jackson ran very well to win a silver medal in the 1959 SAAA Three Miles, losing narrowly (by two tenths of a second) in a sprint against Alastair Wood of Shettleston (and later Aberdeen AAC), who finished in 13.58.6. That season, Adrian recorded a faster Three Mile time of 13.52.2 and was fourth in the Scottish ranking list. After 1961, it seems that Adrian Jackson retired from athletics and concentrated on his medical career, becoming a Consultant Anaesthetist in Cheltenham. However from 1982 onwards he competed with considerable success as a veteran in the World Medical Games, winning fifteen gold medals. In 1982 the event was termed The Medical Olympic Games and Adrian won both 1500m and 5000m (16.58, which set a new record). Later on, he competed in half marathons, triathlons and even the 1992 London Marathon. It is however as a runner with Edinburgh University that he will probably be best remembered in Scotland/ He was probably at the height of his powers as a runner then – note his racing in international races during that period . There was an interesting double act with Hunter Watson at that time: invariably when representing Edinburgh University against another university or a club, Hunter led for the first three laps and Adrian got away from him on the final lap. No one ever split them . However, the tables were reversed on one occaion when Hunter did manage to beat Adrian in the mile: on that occasion for some inexplicable reason he led and Hunter was able to out sprint him on the final straight. Thanks to his pace making his team mate was able to get down to 4:18.1 on that occasion and, as a consequence cut 5.2 seconds from the record for the East of Scotland mile championships in 1955. The press did not report who the previous record holder had been but, almost certainly it had been G.M. (Morris) Carstairs, someone who had finished sixth in the 5000 metres in the 1938 European Championships. There is no doubt that Adrian Jackson would have been a top class athlete in any generation and Scotland was lucky to see him racing at his best. He died on 1st May 2014.